So what exactly is a Ramble? Well, not your average bike event, that’s for sure. A Ramble is a multi-day event, with supported ride stops and catered camps. 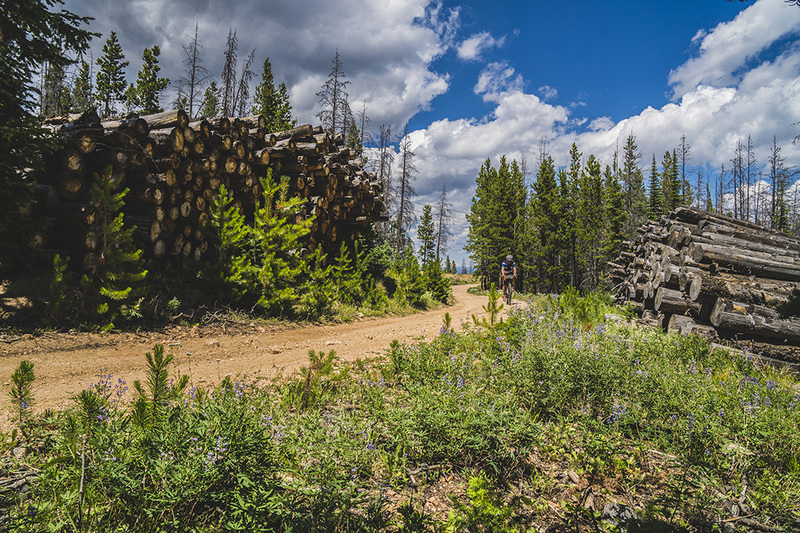 Each ride takes you through unique landscapes along challenging routes. The overall mileage for each ride is about 200 miles split as evenly as possible over 3 or 4 days of riding. We keep the routes to as much dirt as possible and cover county gravel roads, forest roads, and even some double track when we can. And the views are always amazing. For the ride, you carry your basic gear each day. 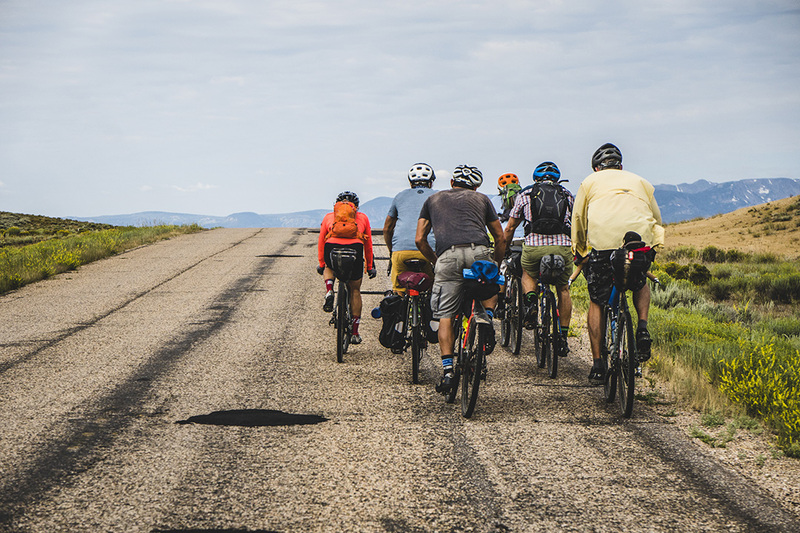 Because we’re taking you through some spectacular and secluded locations, the goal is to carry what you’d need to be self-sufficient for a 75-80 mile ride with the ability to comfortably wait for support if needed. Call it bike packing light; many return riders put more gear in their camp bag. On the route, you’ll see riders geared up for the full self-supported challenge as well as others in lighter adventure-riding mode. As challenging as the routes can be, camp life makes up for it. Fully catered, Ramble camps are the place to come together and share the day’s adventure and a few laughs with friends. The other thing you’ll notice is we limit participation. We do this for several reasons: First is the impact on the routes. 90 folks riding bikes on back and gravel roads is a lot. It’s also an impact on the camp locations even though we stick to campgrounds. Most importantly, it offers an intimate experience to share with a smaller group of like-minded friends but still gives you the opportunity to find time to yourself or a small group. Rambles in the past have been transformational for folks and quite possibly be one of the best rides you’ll do all year. The format is specifically tailored to those new to bike packing and adventure riding. At the same time, even accomplished riders and bike packers will find the adventure rewarding. A Ramble is an event that you’ll long remember. You know the saying that it’s about the journey, not the destination? Well, the Ramble is about both. A rider meeting is held the evening before departure. Start time is 6:30 pm and they last for a few hours. Part mixer, part meeting, we’ll catch you up on any announcements, introductions and answer any last minute questions. Lodging this night is up to the participant, though we do work to provide options for those willing to camp. Afterward, it’s a good time to get to know your fellow rider or go out in one of the depart locations. Just don’t stay out too late. Rides depart in the mornings. Rides start at 7:30 am and all leave from rider meeting locations. We reserve the right to adjust this depart time and will make any change announcement at the rider meeting. Breakfast items and coffee are available. Lunch on the route is typically half way. Geography plays a part: we’re not going to fill you up before a big climb, but we shoot for that mid mark. All lunch and water locations will be marked on maps distributed at the rider meeting. Natural water is available on all the routes so bring a water filter. We heavily emphasize that this is a bikepacking adventure and as such, you’re responsible for knowing your needs. We provide the tools, but if you’re looking for a Gran Fondo with aid stations, every 20 miles look elsewhere. Depart times on day two, and three are up to you (kinda). Breakfast starts at 6 am. If you want to start earlier, let us know, and we’ll get you fed. You need to be on the road no later than 8 am, earlier if you plan to stop more or ride slow. Don’t be offended if we ask you to be an early depart one day. We find this process helps manage arrival times, mingles the group better and keeps everyone in a safe corridor when on the route. The ride is sagged. You’ll ride more than you think, but never more than you can. On route we have multiple vehicles and one van which brings up the rear, pulling signage and any water stations. The number of vehicles differs depending on participant size, but minimally two vehicles and a motorcycle. We don’t want you to get in the van, but it’s there if you need it. Medical support is also on the route. Sometimes in a van, often on a bike, we have multiple emergency medical professionals should it be needed. Dinner is at 6 pm and stays open until the last rider finishes. We do start pulling riders from the course at four if you’re more than 20 miles from the finish. We do this for safety and to ensure the group gets to camp within a decent window. Our average pace on these rides is 10mph with about 60 minutes of stopping. That means most riders will get to camp between 4 pm and 5 pm each day with a 7:30 am start on a typical Ramble day. Enough time to get camp set up, clean up and have a beer or two. A final dinner is a sit-down event on the last night. You’ve just completed an awesome achievement. Time to celebrate. Each Ramble finale is a little different, but plan to spend some time with us at the end. Family and friends are welcome to attend for a nominal fee and with advanced notice. Point to point events will shuttle you back to the start on the following day. We try to leave around 11 AM. You’re not obligated to take the shuttle if you have folks picking you up.